"The aroma of this cake is heavenly, and the taste is scrumptious! It's wonderful with mid-morning coffee. You can also serve it at brunch, or with ice cream as a dessert. The blueberries help make this a special treat." In a large mixing bowl, combine flour, sugar, baking powder, cinnamon and salt. Gently fold in blueberries. In a small bowl, whisk together the egg, milk and butter. Add to the flour mixture and stir carefully. Spread into a greased 8-in. x 8-in. baking pan. Combine all topping ingredients and sprinkle over batter. Bake at 425 degrees F for 20-25 minutes or until top is light golden brown. Serve warm or at room temperature. 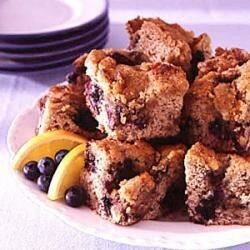 This coffee cake is the best. I used more blueberries and did not use the walnuts (didn't have any at home) Just delicious. This is a keeper.